Demag Service recently modernised two identical double-girder travelling cranes at the Albbruck-Dogern (RADAG) hydrolectric power station, which is located on the border between Germany and Switzerland. Following extensive work on the drive and control systems, both 80-year-old now meet today’s requirements. The two double-girder overhead travelling cranes were each equipped with a 150t hoist unit and a cantilever crab to be able to perform repair work on the turbines and replace machine parts. Besides the modernisation of the drive systems for three motion axes, the customer also wanted the entire electric equipment on the cranes to be replaced and a crane control system with safety functions to be installed. The availability of one crane installation had to be ensured throughout the entire conversion phase. In order to lift the components, which weigh more than a ton, Demag Service first installed an I-beam girder with a chain hoist below the building’s roof structure. This additional lifting device was the key for the logistics challenges at this construction site. The first requirement involved the replacement of the drive units on both of the 150t hoist units, which had an additional intermediate gearbox. On the basis of a fresh survey, Demag Service designed a shaft with which the output of the new hoist motor is transferred to the gearbox. The integration of a safe dual-channel load sensor system in the steel superstructure of the existing crabs ensured that further requirements were met for the new lifting solution. Due to the limited capacities of the crab, the Demag modernisation experts developed a stand-alone tender solution which is mechanically coupled with the main crab for a second hoist unit. Thanks to its faster lifting speeds and smaller bottom block, the customer uses this 10 t hoist as a co-axial unit for flexible maintenance and repair work. Previously, an additional hoist unit had travelled along the outer edge of the crane girder on a cantilever crab. This arrangement offers the advantage of also reaching the edges of the workshop with the crane hook. The installation of a new cantilever crab of compact design with a Demag 6.3t rope hoist met the need for a versatile lifting device. Installing a railing inside the crane bridge to provide additional protection against falling improves safety. All work on the walkways had to utilise bolted connections, since the riveted steelwork precluded any welding due to the expected deformation caused by the higher temperatures. The previous complicated power supply line via a cable drum with a power infeed point in the centre of the workshop was replaced by a narrow conductor line system installed beneath the crane runway. The crabs are now supplied via trailing cable lines that are suspended from KBK 25 profile sections. The integration of many electronic components has enabled both overhead travelling cranes to bridge a technological gap of more eight decades and their control systems are now on par with those of current process cranes. To this end, a Siemens S7 failsafe PLC was installed which communicates via Profibus and Profinet. The hoist unit and supporting structure are protected against overloads by the electronic load detector. The load spectrum recorder records all loads on the hoist units during operation. Thanks to the new control system, synchronised operation of both cranes is ensured in tandem mode for the main lifting and cross-travel motions. In addition, run-on of the cross-travel drives has been synchronised. This enables the cranes to safely lift and transport the turbines and other large-volume parts of the installation, for example. 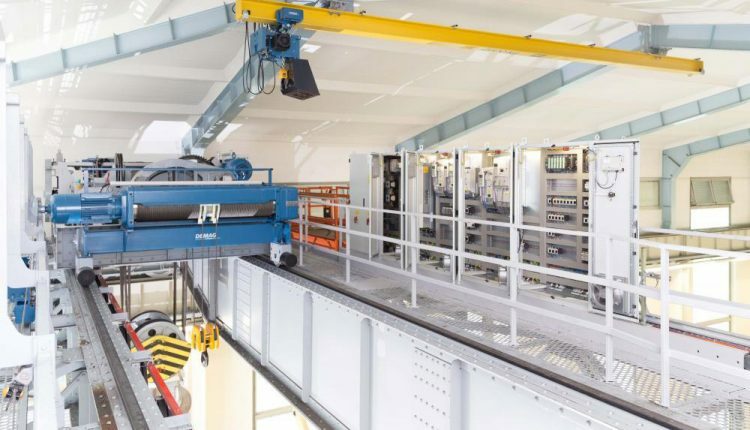 To do this, both cranes communicate over a reliable Profinet connection via an optical data transfer system. The inverter systems integrated into the installation also features power recovery, with which any superfluous energy can be utilised. The cranes can be controlled at a convenient distance from the load via a radio control system that was also included in the modernisation package. The crane operator can also receive important status information and messages via the display on the radio transmitter. Following the modernisation work, the crane still has some open gear components, which have to be reliably maintained. In the past, this had to be done regularly by hand. Today, the task is performed by a central lubrication system, which pumps the required lubricants to the various points where they are needed at specified intervals.